Day 1: Your journey begins by departing London and travelling to your first stop, the university city of Cambridge. Whilst here you'll be able to visit some of the famous colleges where the likes of Stephen Hawking and Sir Isaac Newton studied, and perhaps partake in a Cambridge tradition; punting. After lunch you’ll continue north to the historic city of Lincoln. Here you can visit the Cathedral or explore the historic castle where you can see an original copy of the Magna Carta, written in 1215. Day 2: This morning, your first stop is the charming spa town of Harrogate before traversing the beautiful green valleys of the Yorkshire Dales National Park. You'll meander along country lanes towards the stunning Asygarth Falls, which featured in Robin Hood: Prince of Thieves. After lunch in the market town of Hawes, enjoy the scenery on your way into the Lake District. This afternoon you’ll visit Grasmere, where you can try the famous gingerbread and visit Dove Cottage; home of the famous poet Will Wordsworth. Day 3: Today you'll travel around the highlights of the Lake District. You’ll start at Hill Top; home of Beatrix Potter, author of the Tales of Peter Rabbit. Next, soak up the mountain scenery as you negotiate the Honister Pass; one of Britain’s most dramatic roads. After lunch in the market town of Keswick you’ll stop at the ancient Castlerigg Stone Circle; thought to be over 4,000-years-old. 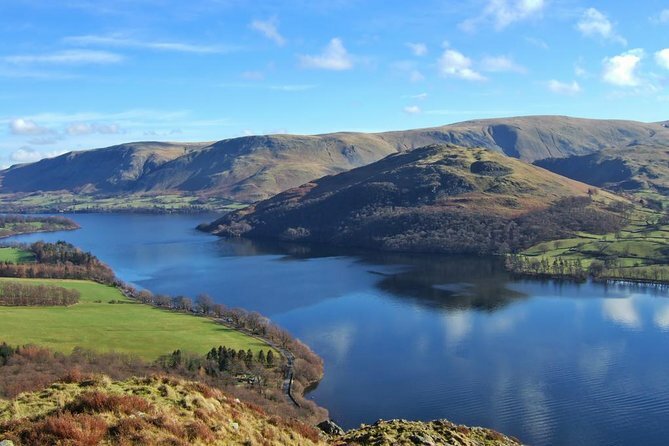 This afternoon travel you'll see the beautiful Ullswater Lake, with a stop at Aira Force Waterfall. Then it's back to Lake Windermere with time to explore and perhaps take a boat trip. Day 4: This morning you’ll travel back to York, where you’ll have the afternoon free to explore this beautiful and historic city. There’s lots to do here, including; a visit to the magnificent York Minister, discovering the celebrated National Railway museum, taking a wander along the city walls, learn about the Roman and Viking history of the city, navigating through the historic central streets known as ‘The Shambles’, or joining one of the famous ghost tours. Day 5: Your final day begins by travelling to the Peak District National Park to visit Chatsworth House. This is one of Britain’s grandest stately homes; famous for its connection to Pride & Prejudice and as the home of the Duke of Devonshire. After ample time to explore this astonishing house and grounds, you’ll travel south to Stratford-upon-Avon; the home of the world’s greatest playwright, William Shakespeare. Here, you can discover Shakespeare’s story and the visit many places with a connection to him, like his birthplace. Now it's time to return to London where your adventure concludes. The tour will return to the Mercure London Kensington Hotel by approximately 6.30pm on Day Five. If traffic conditions allow, it is possible to do an additional stop on Bath Road, Heathrow, for those staying in the Heathrow Airport area.